Fort Montego, located in Montego Bay in the parish of St. James, appeared to be a large fort. It housed four 12 pounder guns and five smaller guns. It was built to guard the approaches to the town of Montego Bay, however, it was an inefficient fort. 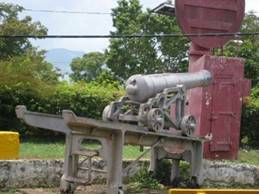 In 1760, one of the fort's rusty guns exploded and killed a gunner while firing a salute to celebrate the surrender of Havana. Edward Long, noted Jamaican historian, a few years later found the fort in decay and doubted whether it was worth repairing, since its location, according to him, was not very strategic. The only occasion the fort fired at a ship was in 1795 when the officers at the fort mistook an English ship for a French privateer. Luckily there were no casualties.